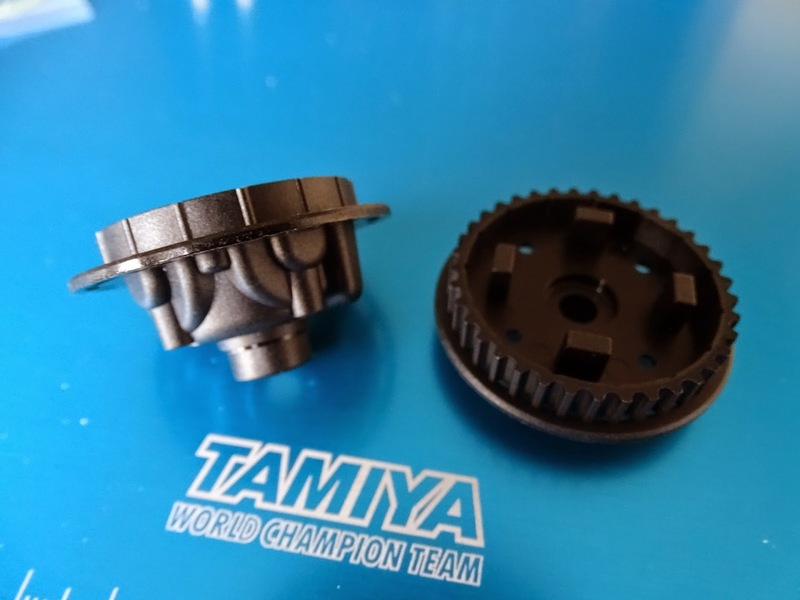 One of the new parts for the TRF419 is a re-designed gear diff. The previous one was fine but some did have issues with it leaking and feeling notchy. The new version however is a big step up in both smoothness and build quality, some of the TRF guys were saying that the diff alone improved lap times in their cars when they tested it. The good thing is that it will fit a wide range of the belt driven TRF onroad cars from the 416 onwards so it could be a great upgrade for a lot of racers. 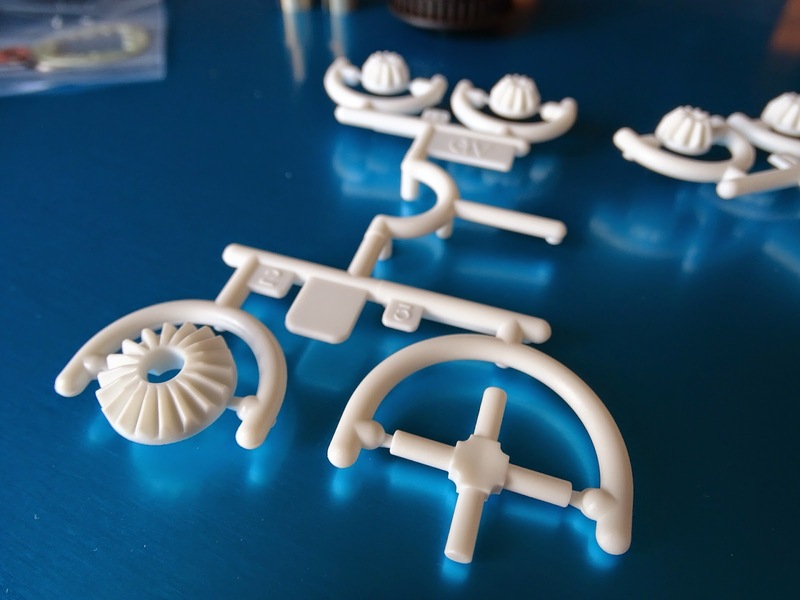 Here you can see the main new components. 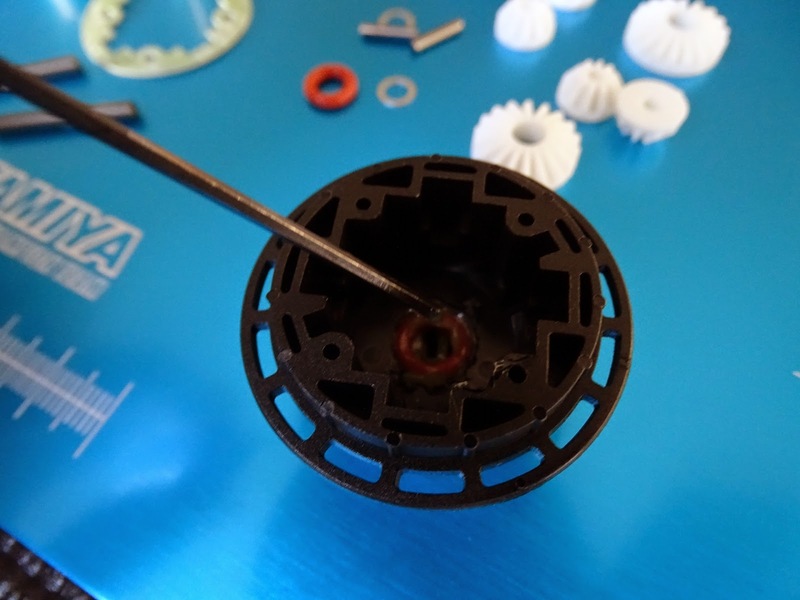 The new internal bevels are moulded from a new plastic, the teeth are larger and there are less of them, making the diff even more reliable under heavy load, and mod motors. The casing has also been changed, there is room for much more oil in the cylinder now. This ensures that the oil temperature can remain more stable as it will not overheat as easily, making the diff more consistent through the race. The two halves are really nice, and you can see the ridges on the edge that ensure the diff halves slide together smoothly and precisely. Here are the rest of the components. Other new parts are the diff outdrives, these are now the same length for both the left and right sides. 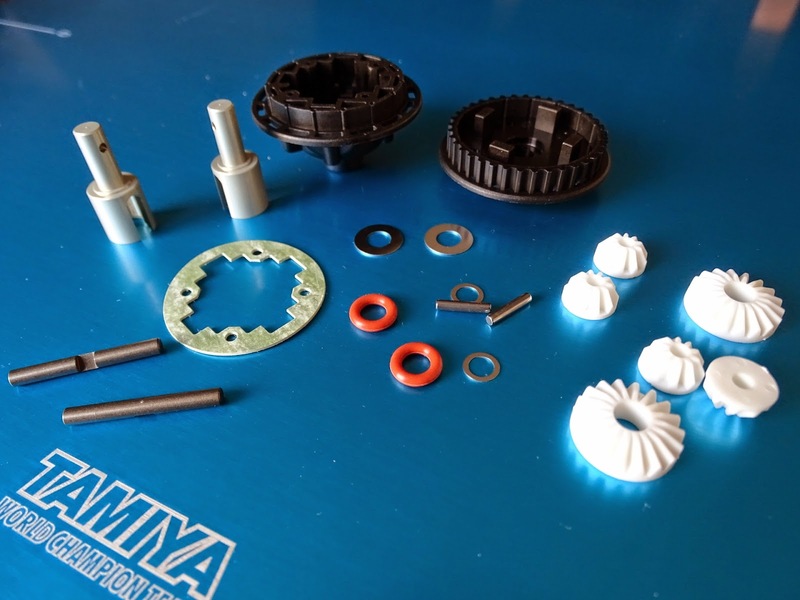 The rest of the parts are familiar to anyone who has built the previous diffs, the cross shafts are the same and you also get shims for both the large bevel gears and the smaller spider ones. The kit also comes with both the black and hop-up orange O-Rings. I have used the orange ones for some time now on the previous gear diff and they stopped any issues with the diff leaking. Some people like the XR972050 X-Ray 5x2mm Clear O-Rings (Thanks to Ed Clark for the tip), these seem a little large so you will need to try some thin shims to compensate. This is easy and it's worth doing this to ensure that you do not get any snags when the gears mesh. Now just slap in some Associated Green Slime on the inside of the diff case where you will place the O-Ring. Then slap a load of the green slime on the o-ring and insert it into it's housing in the diff case. 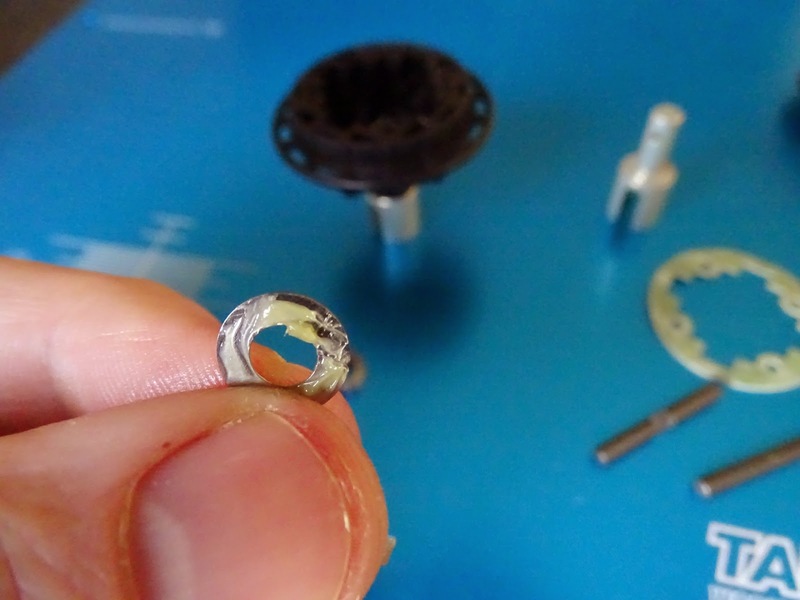 You want to ensure that the whole ring has slime on the inner and outer edges for the best possible seal. The diff half then has to be inserted along with the 5x8mm bronze bushing. 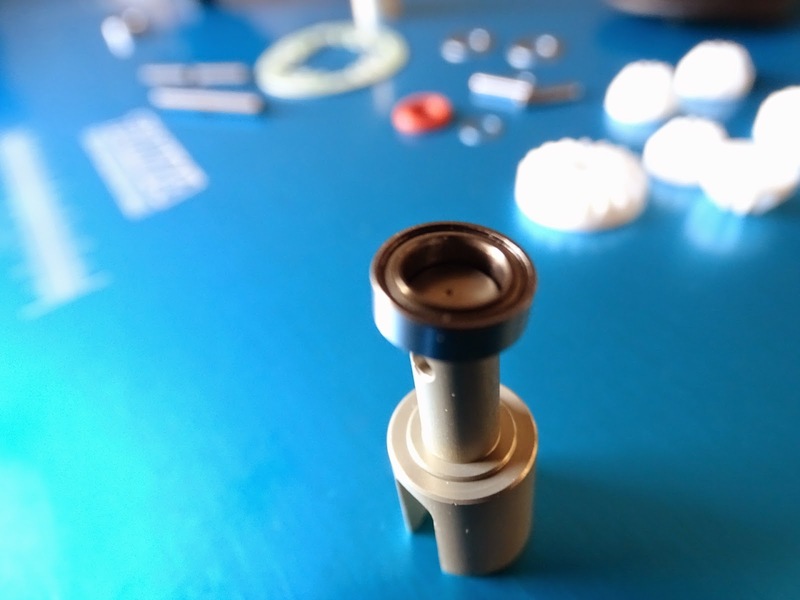 I actually replaced the bushing with a bearing, I have done this for other similar diff designs (Like the TBEvo 6) I'm not certain if it helps but in my mind it's got to be better than just a bushing. (Update it is not). 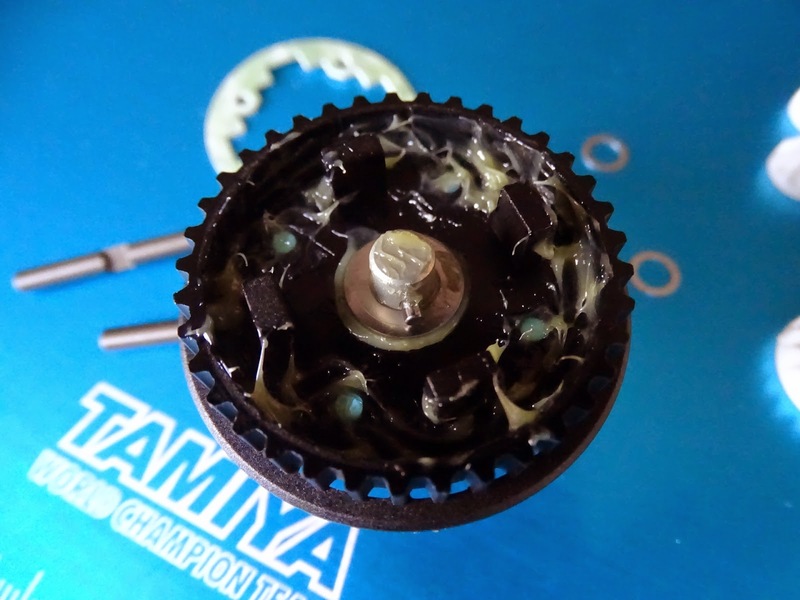 Tip - Use the Bushing's and lash some green slime or Tamiya AW Grease on the inner and outer sides to reduce the likely-hood of the diff leaking through the bushing. 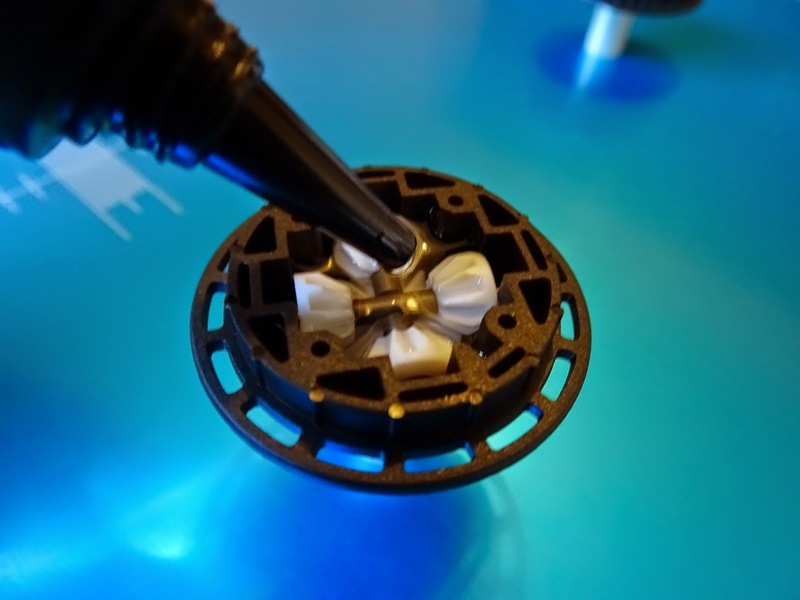 If you want to use bearings an alternative is to use rubber shielded ones. Again using a bushing doesn't seem to make the diff any less smooth. 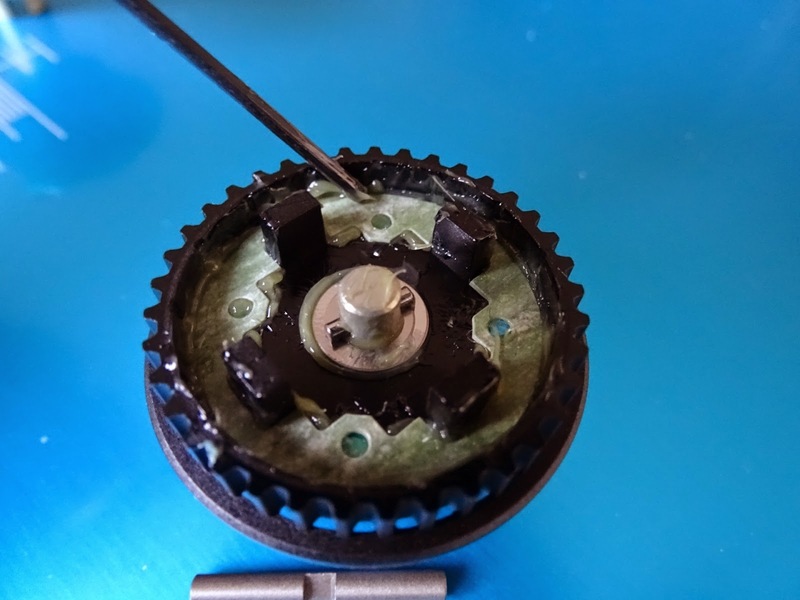 Now its time to fit the large shim over the O-ring, I also coat the back of this shim with a smear of Green slime, this helps keep the diff sealed and it also helps ensure that the O-ring stops swelling due to unwanted friction. 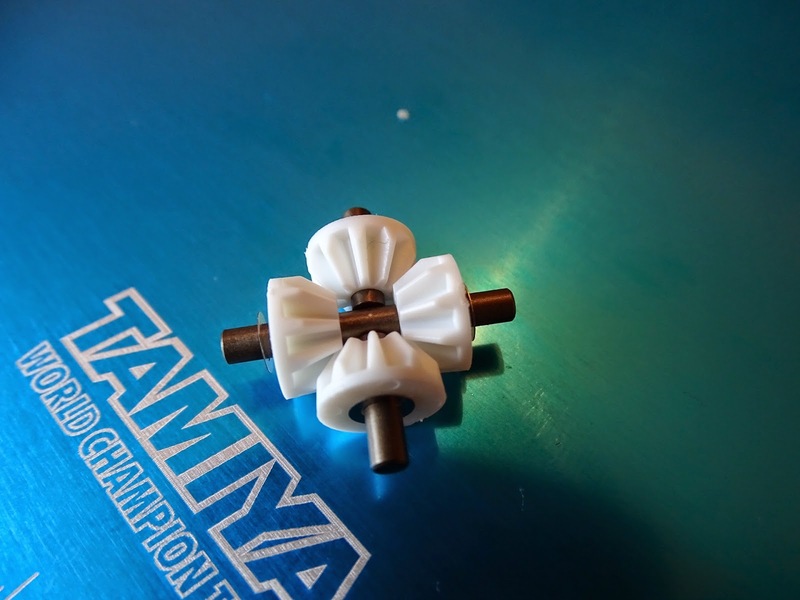 Tip - For a perfect diff use the Tamiya 42313 Large shim set for gear differentials. These work really well and stop warping over time and also eliminate any real sweat from the out-drives. It's the finicky tweezer moment trying to get the small shaft through the hole. 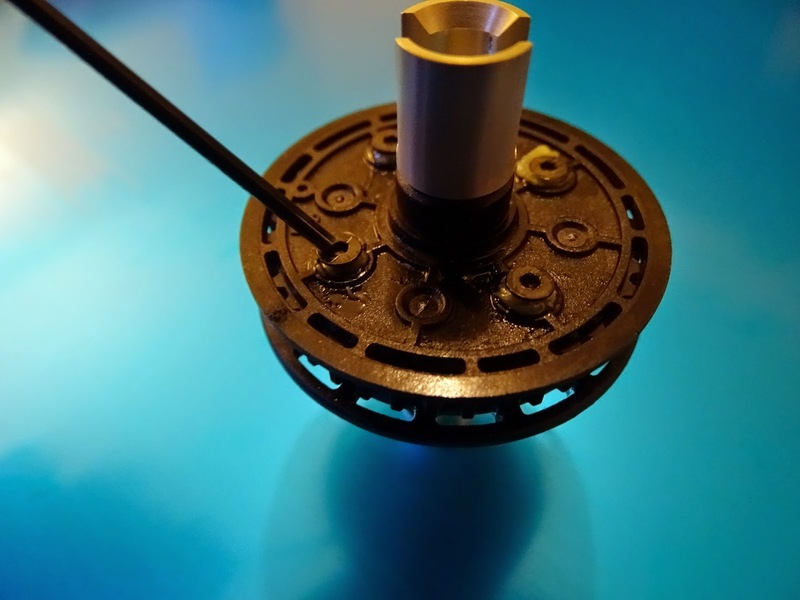 Then click the large gear on top of the shaft (It fits with a nice reassuring click), the result is that it spins smoothly and there is very little lateral movement on the shaft. The other half is the same basic constriction, however this side also has the gasket. Splurge green slime around the inside edge of the diff cylinder and over the screw holes. 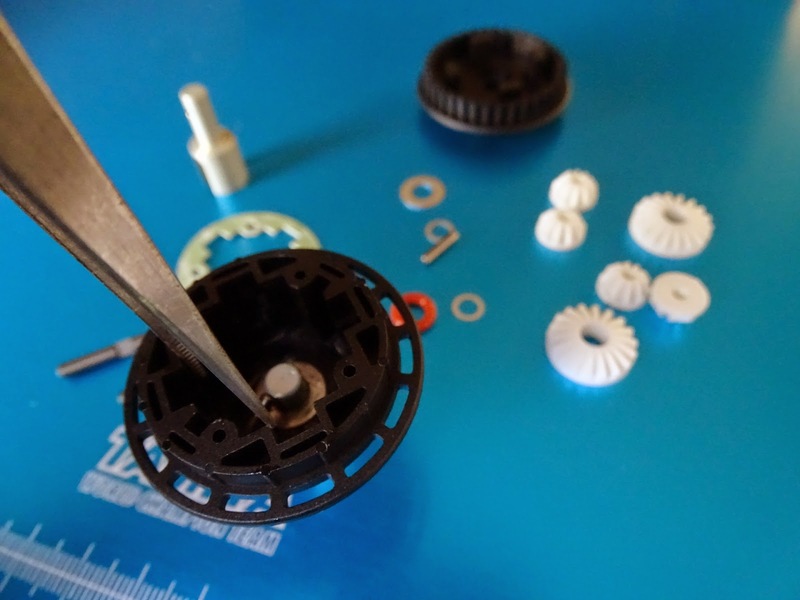 Now we assemble the inner gears. These now have shims and the fit when you place them in the diff is really very precise, a much better step up from the previous gear diff. Now it's time to fill the diff up with the oil. I use 5000 oil in my base set-up. 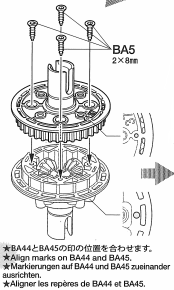 When filling the diff just ensure that the oil is up to the top of the small bevel gears. You want to leave the oil to settle for a while if possible to get any air out, if you have a large shock pump you can use this to help speed up the process. I like to twist the diff half whilst pushing down on the cross shafts to get rid of trapped air quickly. Fitting the two diff halves you now have to ensure that the bottom and top halves are perfectly matched. Its a little difficult as once the diff is full of oil you have to look underneath to find the spot. So I just marked it with a paint pen on the side to ensure I didn't have any issues locating it. The two halves slide together very smoothly to make a perfect fit. Now it's time to finish it off. Do this in a cross pattern to avoid any warping. 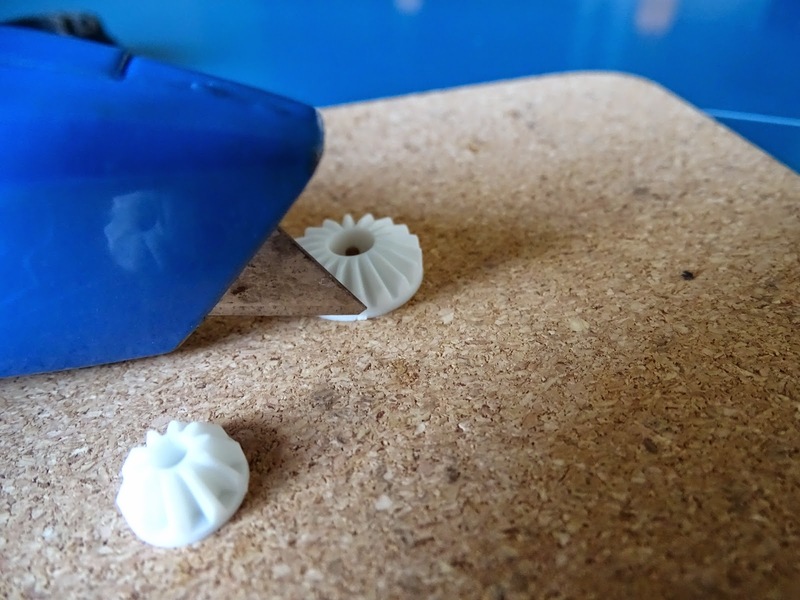 I get to around 1mm from having the screws being perfectly seated and then just take my time gently screwing them until they are all firmly seated and tight in their holes. The built diff feels very smooth and I have now raced it for 4 race meetings and it's still smooth and leak free. For those with previous TRF's (416,417,418) who want to upgrade to this diff. 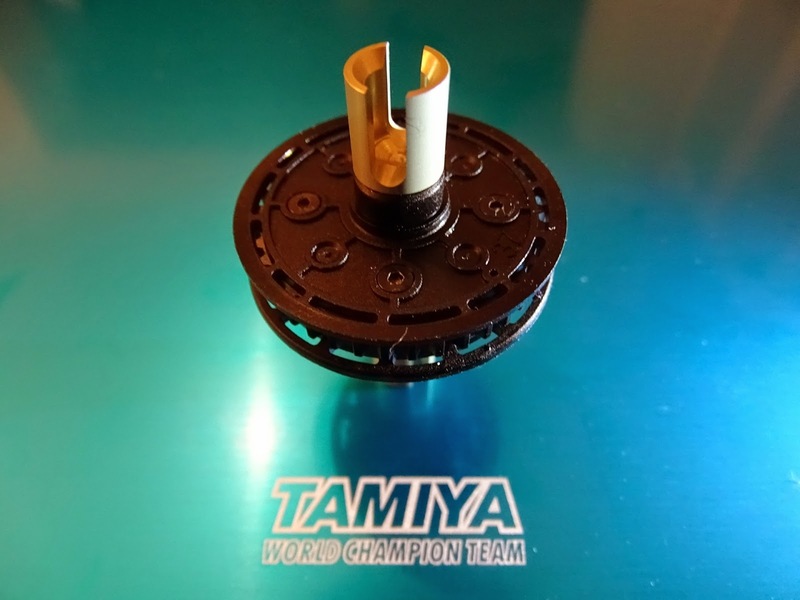 It is available already, just search for Tamiya part no 51568 for everything you need. Personally I wouldn't say that you need to upgrade, but it is definitely worth considering when it's time to service your old diff, or if you find your current older diff not performing how you would like it. This is very helpful, I had major problems with leaking diffs.